What’s almost as exciting as seeing the rains tapering off, temperatures rising, and hot air balloons flying?? Well, launching a brand new website, of course! Ha, okay, so maybe it’s not quite that exciting for everyone else, but it certainly is for me! After almost 20 years in business and almost 10 years of counting on the site built by my hubby Jim, the time had come for us to get with the mobile-friendly program and give our website a serious facelift. Turned out pretty nicely, don’t you think?? Since Jim has taken a more part time role in the ballooning business lately to spend more time as a personal trainer, we turned to my super cool big brother, Lance Teitsworth for our new website. God gave Lance ALL of the artistic ability in the family, and thankfully that has turned into a knack for creating not only beautiful art, but also robust, functional and highly attractive websites (check out what he created for my Dad’s balloon business at www.libertyballoon.com and you’ll see what I mean!). 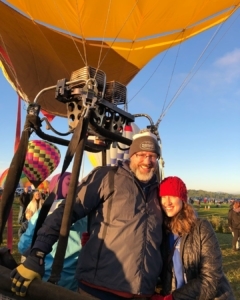 Pictured here with his beautiful, kind and gentle wife Jess, Lance is not only webmaster for Liberty Balloon Co and Blue Ridge Ballooning, he is also a commercial pilot AND has his own business, Liberty Custom Tours. If you’re ever in the market for the best narrated tour of Finger Lakes Wine Country, Lance is your man! The greatest benefit of collaborating with Lance on the new website has been simply the opportunity to become reconnected in each other’s lives. We’ve spent hours on the phone trouble shooting, brainstorming, laughing, talking, and generally just enjoying working together… but we’ve also used the time to get caught up on real life stuff. How incredible is it that I’m able to not only have a home-based business doing something I love, I also get to do it with my favorite people in the world? 2019 promises to be a year of exciting changes… and launching this new website is only the beginning! Browse through the plentiful information, share the lovely pictures, follow us on Instagram, and join us as we embark on the adventure of a new balloon season!